Continuing this New Orleans kick has been strange. It makes me sad to think about the devastation, but, I feel like pots and pans hanging idle in empty kitchens means the world is missing something. Cooking my favorite New Orleans dishes is my way of carrying the torch until New Orleans is "back." With no plans for dinner and cans of beans in the cupboard, I ran home over lunch, stopping at Safeway for Aidell's andouille and smoked turkey legs. I got some store brand andouille too, to compare. Sausage, turkey legs, veggies, seasonings, four small pork chops (from the freezer-- random factor), and water went in, the fire was on low-med, and I went back to work. It was bubbling away gently when I got home, with maybe 1/3 reduction of the liquid. The pork chops broke apart easily, and the meat fell off the turkey leg bones. 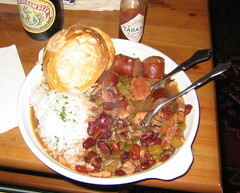 I made rice, toasted some bread, and sat down for a traditional New Orleans Monday dish-- it was great, but the Safeway andouille was garbage. Still, between the pork chops and turkey legs, there was plenty of meat.